Medispec (M) Sdn Bhd is a leading wholesale distributor and marketer of pharmaceutical and healthcare products in Malaysia with an excellent track record of 33 years. Our company is located in Penang, Malaysia. The company’s proven marketing and management systems give competitive edge to the manufacturer’s products. Currently it handles a wide range of pharmaceutical and health care products from countries such as Thailand, Singapore, New Zealand, Australia, India and Bangladesh. 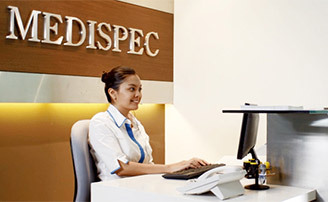 Medispec employs over 100 staff and has its headquarters in Penang. It has a 4 units of 4-storey building in Petaling Jaya that serves as Medispec’s Strategic & Logistic Centre and a sales office in Ipoh. 1. To become the leading ‘brand’ in pharmaceutical distribution in the region. 2. To provide quality & affordable medicines to the people. 3. To strive for total customer satisfaction at all times. 4. To provide a good working environment for our people based on motivation, teamwork and excellent work principles. As a pharmaceutical manufacturer, you would want your products to get to the right market at the right time with the right market intelligence thus ensuring their success. Medispec utilizes the IMS Market Intelligence System to help manufacturer get up to date market information. With the correct market information the manufacturers will only launch products that have the greatest potential for success and growth. Medispec’s in-depth knowledge of the market coupled with excellent rapport built through the last 33 years with both the government and private hospitals, private family physicians and both chain and individual pharmacies further ensures the immediate acceptance and success of your products. Medispec also assists the manufacturer to register their products with the local Drug Control Authority. Medispec (M) Sdn Bhd is an ISO-9001 certified company.